You are here: Home / Toddler / Day 7 of Toddler Play – Finger Paints! Day 7 of Toddler Play – Finger Paints! 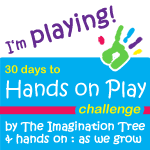 Monday was day 7 of the 30 Days to Play Hands On Challenge. That challenge was to roll out some paper on the floor, tape it together to make a large area, and turn your kids loose with crayons, markers, colored pencils, or whatever they could safely use. True confession: when I saw that for the toddler play suggestion of the day, I nearly scrapped the idea altogether. There’s no way I’m integrating crayons into our toddler play and experimentation. Norton seems to think that crayons are cookies. I’m not a fan of changing colored poo. But then I remembered that I’d just gotten the stuff to make finger paints. After all, we bought finger paints a few months ago, and I just wasn’t too crazy about the fact that Norton eats everything and they weren’t made from kitchen ingredients. 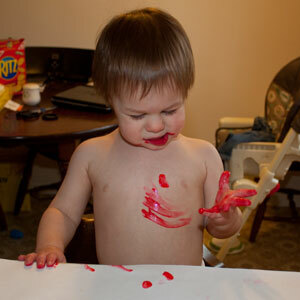 Plus, the store bought finger paints tasted awful and Norton was just not impressed. It was one of those times that I tried to do something with Norton and it failed so awfully that I swore to never try it again. But I did try it again. You know what? I’m glad I did. Norton was playing in the kitchen (and demonstrated that he now knows how to open the dishwasher… boy, was I thrilled :-P) while I was at the counter mixing together the finger paint recipe that I’d found online. (Just cornstarch and water. Here’s the site where I found it.) It’s a good thing that Norton was keeping himself entertained. It was also a good thing that I didn’t count prep time as part of the 15 minutes, because it took forever. Okay, not really, but it was pretty tedious. And mixing cornstarch and cold water is like mixing concrete. Once it was done and separated into different ziploc buckets, I added the food color. I apparently went a little overboard; the paint batch made six buckets worth of goo, and I used a full bottle of food coloring per bucket. Then I stripped Norton down to his diaper, pulled a chair up to the kitchen counter for him to stand on, and rolled out some paper to cover the counter and act as a paint canvas. At first, Norton didn’t know what to think. He saw me dip my finger into the red paint and smear it on the paper. He then decided to follow suit and give it a try. That red paint went right in his mouth. Judging by the amount of paint he consumed (and wore) during our painting time, he found the taste to be someone satisfactory. Even better, this time around, Norton actually started to really just get into smearing the paint with his entire hand. 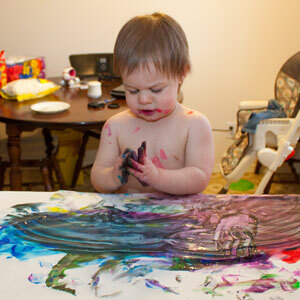 The last time, he tried to crawl off to his dad and left a bit of finger paint on the kitchen floor. What made it different this time? Well, for starters, there was ditching the commercial finger paint for something that had a much thicker texture. I had also let go of having expectations of Norton recreating Van Gogh’s Sunflowers with finger paints. (Okay, not really. Even in my craziest, I realize that that’s a terribly unrealistic thought.) I think the biggest difference, though, is that Norton is now nearly twenty months. He’s big enough to be able to manage these things and have fun with them. Now I’m starting to see that maybe being a crafty mom isn’t so far beyond my reach. And Norton’s first toddler art project is hanging on my refrigerator. Who knows what kinds of cool arts and crafts projects we can find (and put on Pinterest) to do together in the future? Oooo how lovely! I’m so glad that you decided to join in after all! It looks like you both had a LOT of fun! oh you just made me smile a big, big smile – especially with your quote here: “Now I’m starting to see that maybe being a crafty mom isn’t so far beyond my reach.” — you sure can be! I’m so glad this was a huge success for you!! !